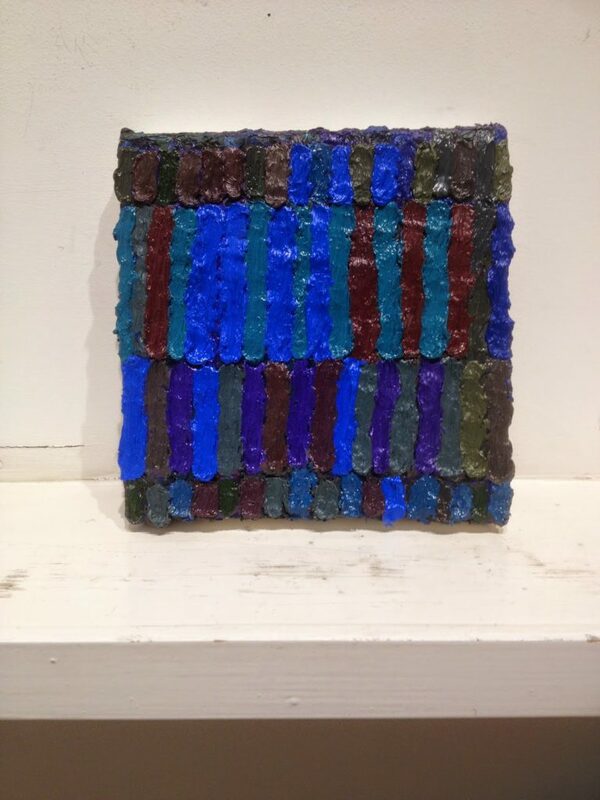 Brett Baker’s new small-scale paintings at Elizabeth Harris are a little bigger than the ones in his last show, and they continue his exploration of line, thickly layered paint, and color. Several years ago, when Baker moved from a good-sized studio to a small apartment in New York, he decided to apply the same effort to miniature abstractions that he had previously invested in mural-size work. The resulting series, which he continued when he eventually relocated to North Carolina and began the blog Painters’ Table, are intellectually enigmatic. By the same token, though, the rich blue palette (many of the paintings are simply titled “Night Studio”) is visually hypnotic, and the heady scent of linseed oil (some are still wet) cuts directly to the heart. Like a wayward lover returning home, these paintings have you at hello. subject to repetition and scrutiny, mark and color are gradually calibrated to achieve a unity and visual complexity. Time is essential to this process – a single painting may take years to overcome the universal and achieve individuality. Over the last decade, I have embraced a dramatic shift in scale. My work has evolved from near mural size paintings to miniatures while maintaining an otherwise similar visual language. Although leaving behind the expanded visual field inherited from Abstract Expressionism, I have attempted, nevertheless, to preserve and condense its energy. My most recent work investigates the possibility that by focusing the field, miniature abstract painting can carry the tradition of heroic abstraction into a truly personal and portable (and perhaps utilitarian) realm. Baker succeeds. Through excessive reworking and overpainting, he manages to push each painting beyond generic abstraction to something more personal–an unusually earnest approach in an era when the look of effortlessness and a slapdash sensibility tend to prevail. “Brett Baker: Recent Paintings,” Elizabeth Harris, New York, NY. Through March 28, 2015. It is a beautiful show. The color and texture are mesmerizing.